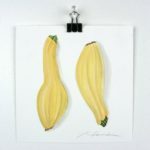 This is an original, one-of-a-kind still life painting of yellow summer squash. 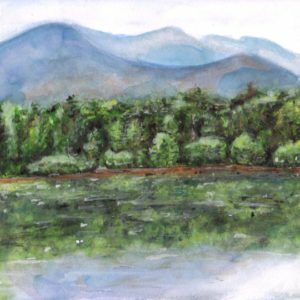 It is a watercolor painting on professional-grade watercolor paper and measures approximately 6″ wide by 6″ long. Shipping is free to the United States. …This still life painting depicts three ripe yellow squashes that I purchased from a local organic farmer at the Norcross Community Market in Georgia. 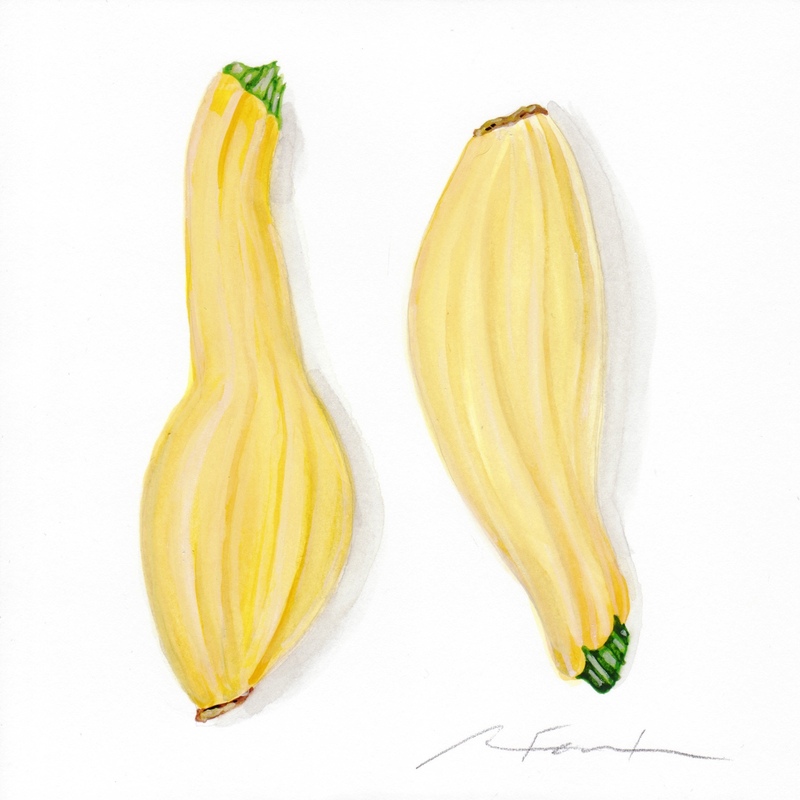 This is an original, one-of-a-kind still life painting of yellow summer squash. 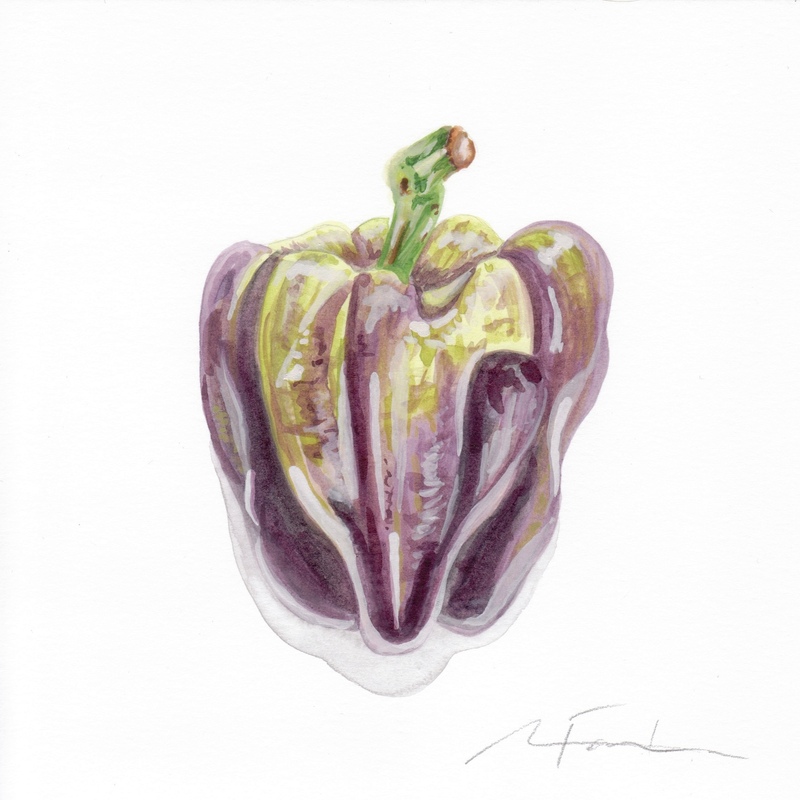 It is a watercolor painting on professional-grade watercolor paper and measures 6″ wide by 6″ long. I signed it in the lower left corner. It is not framed. Depending on your computer, colors may vary slightly from photographs. Shipping is free to the United States. My paintings turn familiar kitchen scenes into in an arbitrary space where glistening, close-cropped fruit pulp becomes its own vibrant world. Hyper-magnifying the inside of ripe fruit in oil paint pays homage to traditional still life painting while distorting the genre. 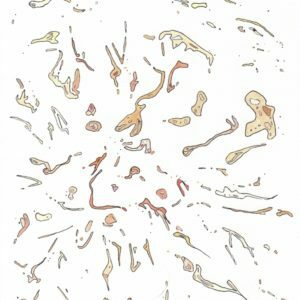 Varying the scale of my paintings and the species of fruit further heightens the enigma, blurring the boundaries between abstraction and representation, the microcosmic and macrocosmic, attraction and repulsion, and whimsy and the scientific. The imagery is readily identified as organic but from there it can take over the imagination. 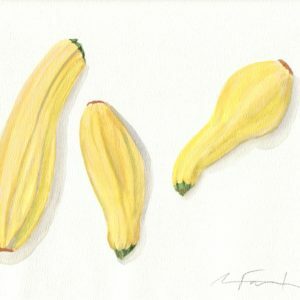 This still life painting depicts two ripe, yellow summer squashes that I purchased from a local organic farmer at the Norcross Community Market in Georgia. I obviously have to paint my fruit and vegetables before I eat them!